Reinbek bei Hamburg: Rowohlt Taschenbuch Verlag, 2000. 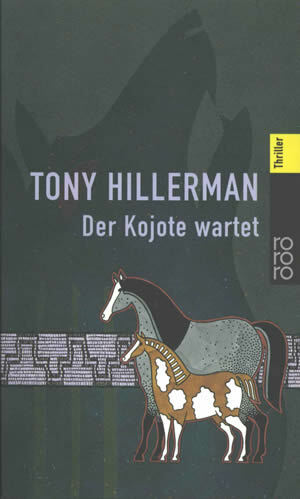 This German reissue edition of Coyote Waits was published by Rowohlt Taschenbuch Verlag in 2000. The German translation is by Wulf Bergner. Cover design is by Notburga Stelzer with illustration by Jürgen Mick. In the foreground of the front cover are two horses, standing in front of an illustrated beaded band with a pink background and a geometric mesa pattern in black. The background is almost completely filled by a silhouetted dark green wolf's head, raised, with open mouth. The overall background is a slightly lighter, speckled green, and the author's name and book title are printed in pinkish gray next to the publisher's series logo. The back cover background is dark green, with a synopsis of the novel printed in white. The bar code is at the bottom of the back cover and the series logo is at the center along the left edge. Binding: Full-color paper covers. The author, title, series number and logo are printed on the spine.